← Police communique warns of suicide bombers in KL and Sabah! Education Minister Mahdzir Khalid has been challenged to reveal those behind allegedly politically-slanted SPM examination questions, and to state if he had a hand in the fiasco. DAP parliamentary leader Lim Kit Siang said in a statement today that Mahdzir should also inform the public if the officers responsible would be punished for such an “irresponsible conduct”. 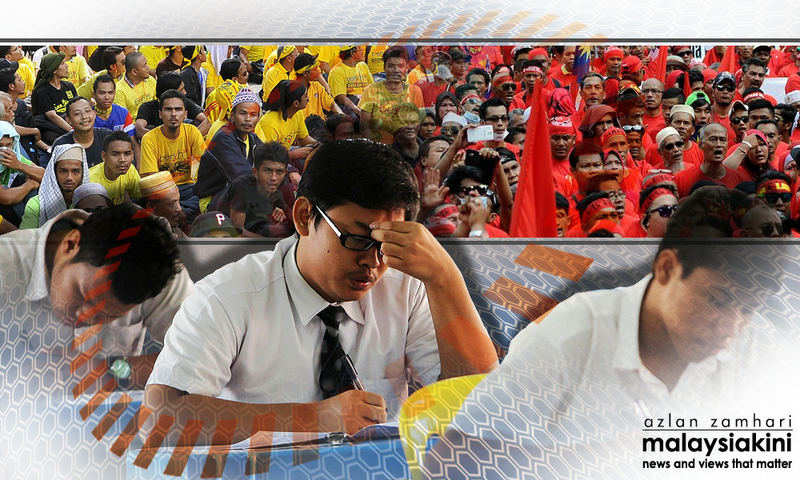 Lim condemned what he described as a blatant attempt to brainwash students with politically-loaded questions on “anti-government rallies” in this year’s SPM moral education paper, as reported by Malaysiakini yesterday. “(The questions) involved a not-so-subtle attempt to tell lies and demonise protest gatherings as anti-government and anti-national, even suggesting that those who participate in them are not high-minded idealists but ‘mercenaries’,” he said. Noting that students were not allowed to remove the question paper from the examination hall, Lim urged Mahdzir to make public the said paper. “(Let) parents and the people judge for themselves whether the questions were appropriate and suitable – like the ‘absurd’ question which asked candidates what were the positive effects of queueing up to collect water during a water supply cut,” said Lim. “Why vilify civil society groups as anti-government and anti-national, as well as subtly spread lies and falsehoods, when moral education should inculcate students with good virtues instead of being ‘brainwashing’ courses?” he asked. This year’s SPM moral education examination caused controversy, due to a question asking students why they shouldn’t oppose the government. However, if you are the exam candidate, what would your answers be? Malaysiakini asked several academicians and politicians this very question to see how they reply, and received a good dose of biting sarcasm. Those who took up the challenge were Universiti Malaya law lecturer Azmi Sharom, Penang Institute fellow Wong Chin Huat, Gerakan vice-president Dominic Lau, PKR vice-president Mohd Rafizi Ramli, and DAP’s Bilut assemblyperson Chow Yu Hui. Here are the responses from those academicians and politicians. (a) Why students should not participate in anti-government rallies? Azmi: Because the government is scared of them. Wong: Because there is no such thing as an ‘anti-government’ rally. In a democracy, the people are the boss. When the bosses gather to talk to their employees or even sack their employees, they are not ‘anti-worker’. Lau: Students are banned from participating in any political rally. Rafizi: Because the government is good; it introduced GST that everyone loves. Chow: Because the students should learn to be grateful to the government. Without government, there is no school; without school, there are no teachers; without teachers, there are no students. So, to appreciate our great government, we cannot oppose it. Tuesday’s SPM Moral Education paper has raised eyebrows on social media in recent days, over some questions alleged as being politically biased. 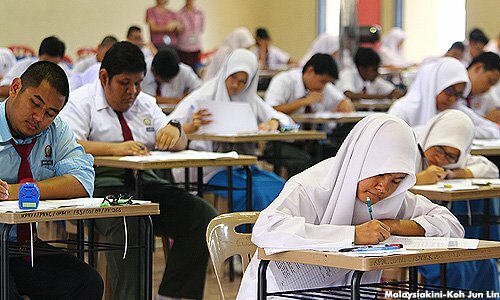 An SPM candidate complained to Malaysiakini that the government appeared to be trying to brainwash students through the Moral Education paper and indoctrinate them, so that they would not participate in political activities. Recalling the question from memory, the student said candidates for the paper were asked to answer questions based on a notice and a picture. The notice states that civil servants are not allowed to participate in anti-government protests; the picture is of two students speaking to each other. Student A is putting up a poster promoting an anti-government rally saying that he would receive RM100 after he finishes putting up the posters. Student B advises Student A against doing so. (b) How should schools prevent students from participating in anti-government rallies? (c) We should support Student B’s stance. Why? KUALA LUMPUR, 19 Nov — Peperiksaan Sijil Pelajaran Malaysia (SPM) masih berjalan tetapi ruang media sosial riuh tentang kertas soalan Pendidikan Moral yang dikatakan penuh dengan soalan berbaur politik. Calon Shankar Chandrsegaran yang menduduki kertas itu dua hari lalu mendakwa satu soalan memerlukan mereka menjelaskan kelebihan jika tidak terlibat dalam aktiviti anti-kerajaan. Pelajar tingkatan lima di sebuah sekolah di Selangor itu berkata soalan itu mengemukakan gambaran seorang remaja mendapat poster untuk menjadi peserta satu himpunan anti-kerajaan dan dibayar RM100, lalu mengajak rakan menyertainya. Seorang lagi calon SPM, hanya mahu dikenali sebagai Tasha dan bersekolah di Subang Jaya, mengesahkan kertas soalan Pendidikan Moral tahun ini penuh dengan soalan berbaur politik. Katanya, soalan “luar biasa” yang ditanya antaranya apa yang patut dibuat jika menghadapi catuan air di kawasan perumahan, dan perlu memilih sama ada mengambil air dari trak angkut untuk ibu mereka atau mengikuti kelas tambahan di sekolah.